At the northern end of the Strip, close to the Fashion Show Mall. 2,716 rooms, mini-bar, 2 flat-screen Tvs, DVD/CD player, Internet (charge), air-con, 24hr room service, floor-to-ceiling windows. The hotel exemplifies lavish accommodation with capacious guestrooms and suites that feature signature Wynn beds and floor-to-ceiling windows that overlook the city and desert beyond. 15 restaurants & bars, showroom, ultra-chic nightclub, casino, 2 swimming pools, whirlpools, gym, full service spa & salon, 18-hole world-class golf course. A choice of swimming pools, a lavish spa, plus an 18-hole golf course provide daytime entertainment and the hotel is also home to Le Rêve - The Dream, an aquatic show of daring acrobatics. Dining is a high point at the hotel with a formidable choice of restaurants. 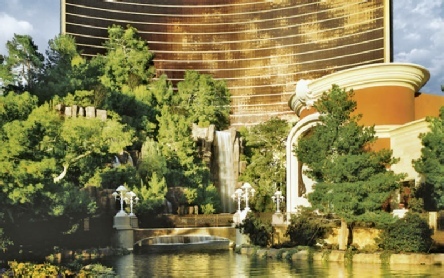 Wynn Las Vegas prides itself on offering none of the gimmicks now associated with Las Vegas hotels. Chic style is stamped onto a tranquil, natural environment setting; floral pathways lead through an indoor atrium and a curtain waterfall that cascades into a huge lake beneath, forms the backdrop for a nightly sound and light show. 2019 package holidays to the Wynn Las Vegas Prices are per person based on two sharing, including flights and accommodation (plus transfers in Caribbean destinations), and are subject to availability. Flights from Gatwick - other departures also available, call for details.